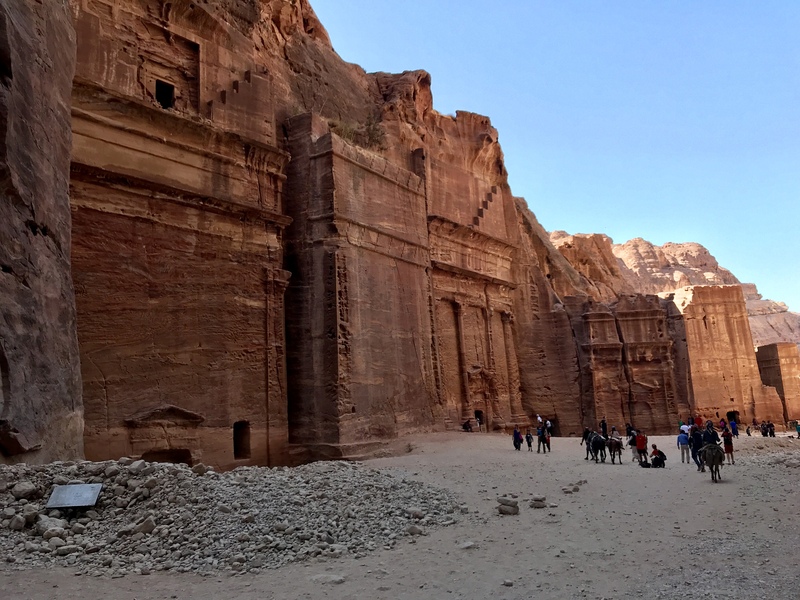 I found Petra a strange combination of a UNESCO heritage site, a circus and Yosemite Valley. It is truly a special place with dozens of impressively constructed stone entrances, beautiful rock, hundreds of abandoned carved homes and great views. This co-mingling with the loud Arabic shouts of men managing donkeys, tourists boasting excited screams as they rise on camels, kids asking me to buy trinkets or post cards and clopping donkey carts pushing through a barely wide enough canyon. In reality, I understand this my own perpetual conflict between popular tourist attraction environments and my own pristine wilderness ethics. Local people are simply trying to make a living and give the average tourist the experience they expect. I try hard to push past this so it doesn’t hamper my enjoyment of these really unique and amazing places of the world. Exiting my bus, I started into Petra at 10:30am. One more drop in a river of tourists from cruises, day trips, guided tours or overnighters like me. 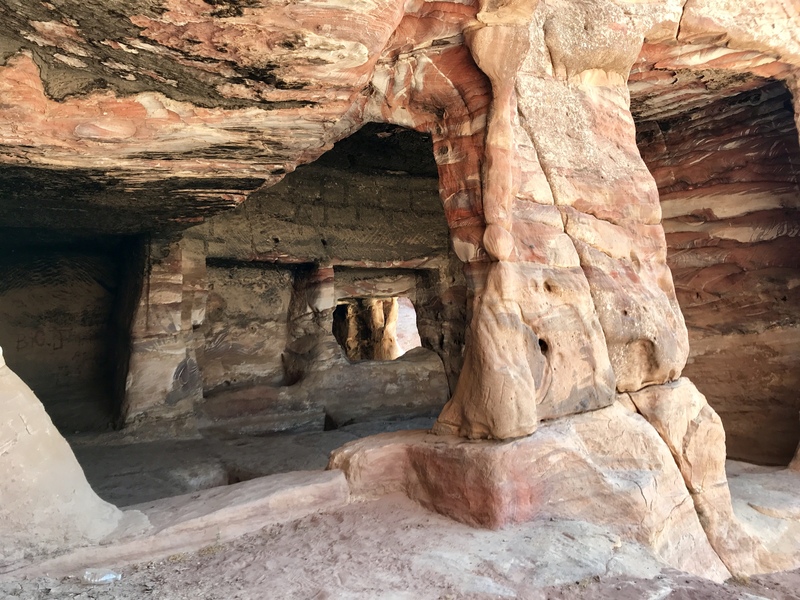 Immediately, I was fascinated and off the trail exploring the carved cube Nabatean homes. Rooms partitioned against the side. Roofs blackened by fire. By the end of the day I would see hundreds of these, most with a soft smell of urine reminding me of San Francisco’s South of Market. 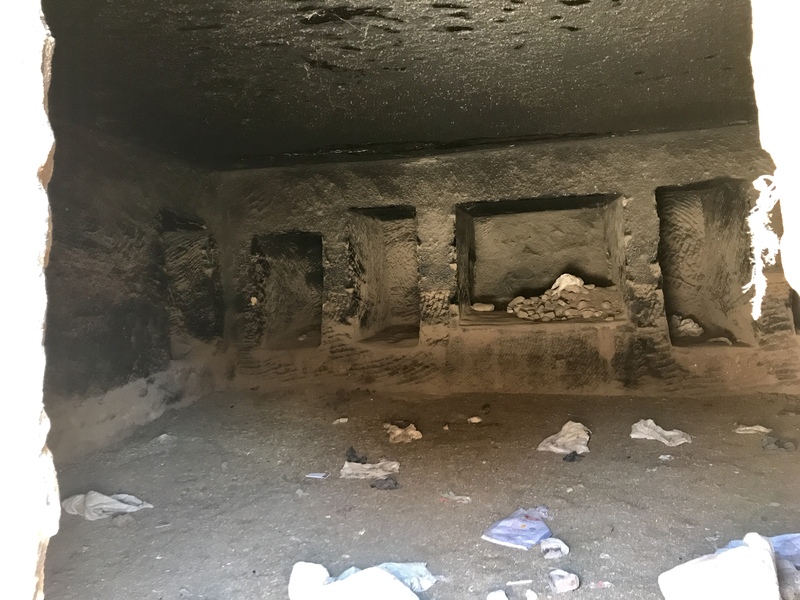 My final conclusion is the smell originates from many of these homes used for housing the numerous tourist transporting donkeys or for rest areas of the hundreds of trinket shop owners ubiquitous in Petra. 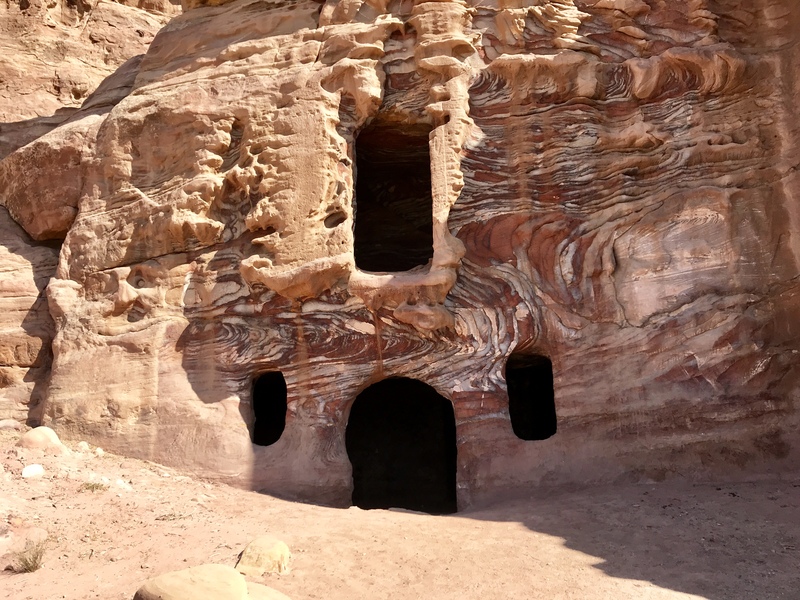 I tried to imagine this was experiencing an aspect of ancient Nabatean life, but I imagine they kept the place they ate and slept pretty clean. 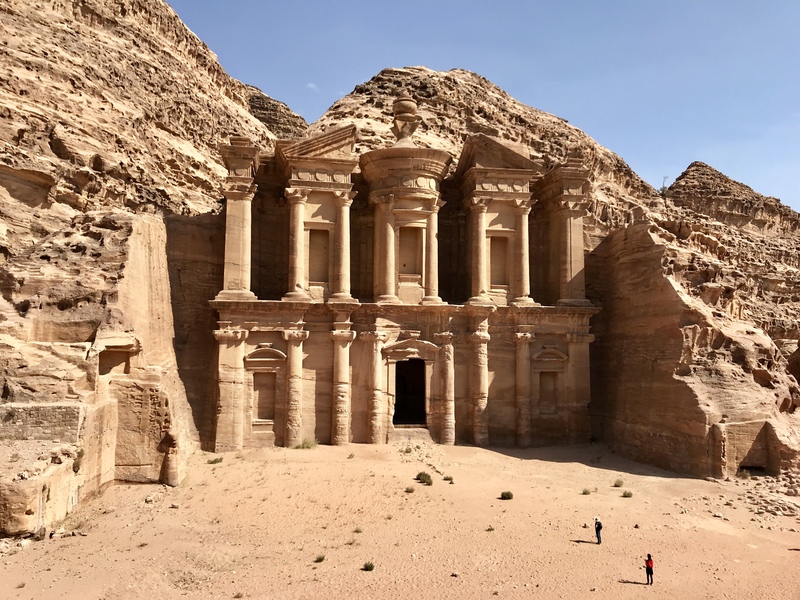 The first large monument appeared on the left across the parallel livestock trail before reaching the Siq, the paved road to the city of Petra. Entering the Siq, one begins to notice the foot wide canals running the length of this canyon on either side. 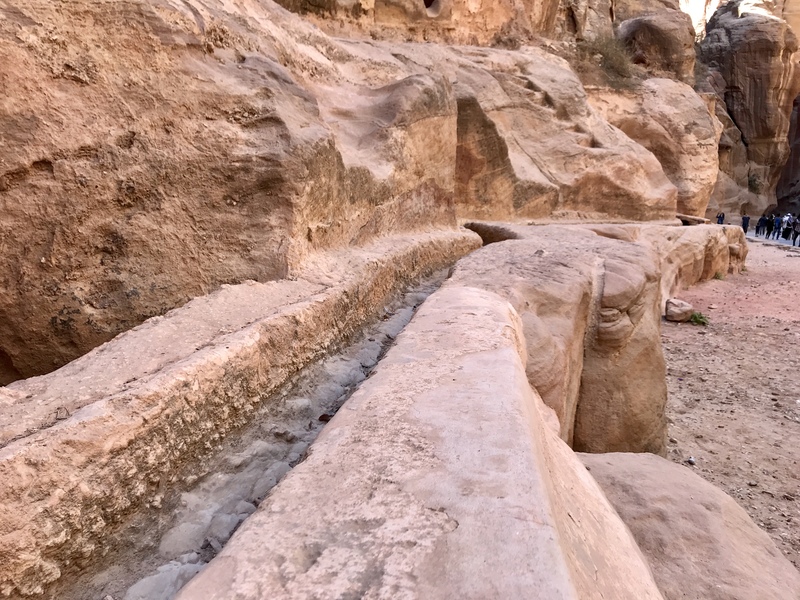 Statements to the skill of the Nabatean in water collection and capture for consumption and to prevent erosion in their city. 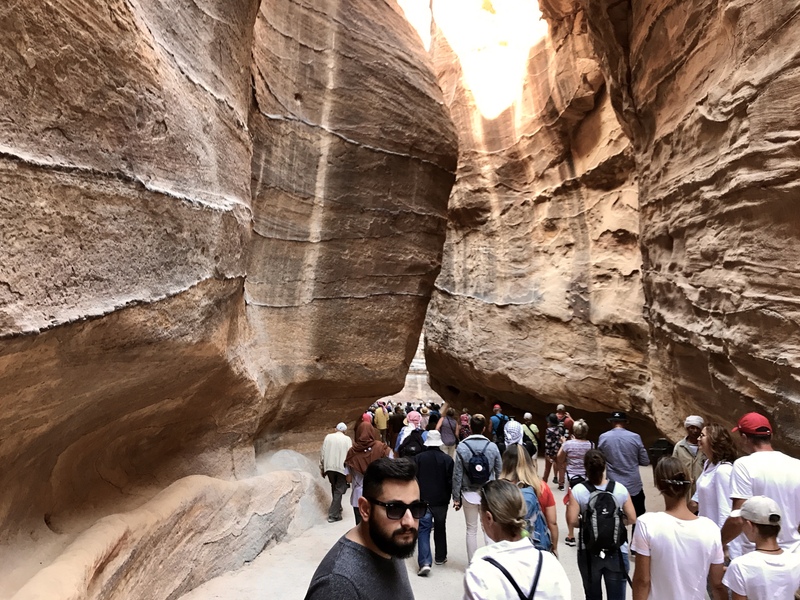 The canyon constricting a little towards the end, it makes a mysterious and grandeur entrance into an open area across which looms the most recognizable monument of Petra: the intricate and massive Treasury Building. Continuing a walk around the corner, a fantastical street of many large carved home entrances leads to the refurbished Roman style theatre. 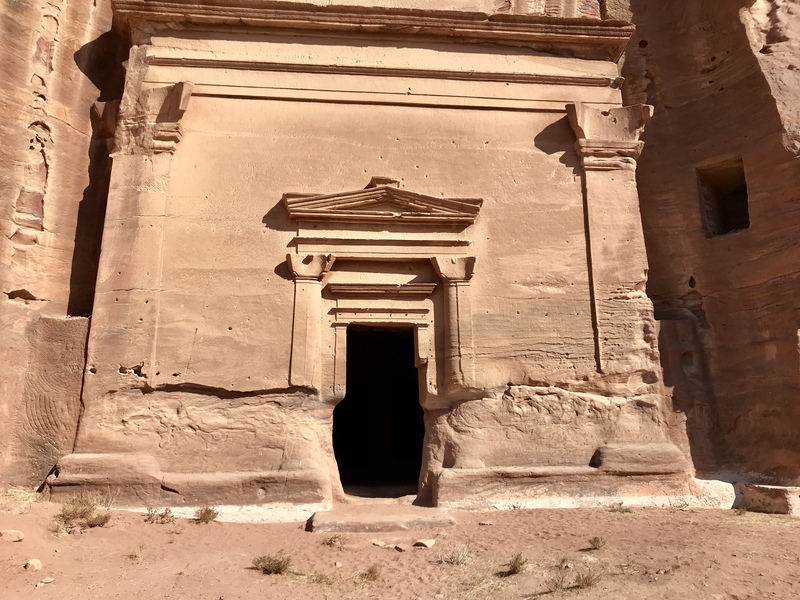 While higher on the right, intricate tombs can be found along with dozens of other carved homes and entrances to be discovered given the appetite to explore. The remaining walk down to the end of the main trail passes modern additives, remnants of Roman ruins. Although, not as impressive as Jarash. 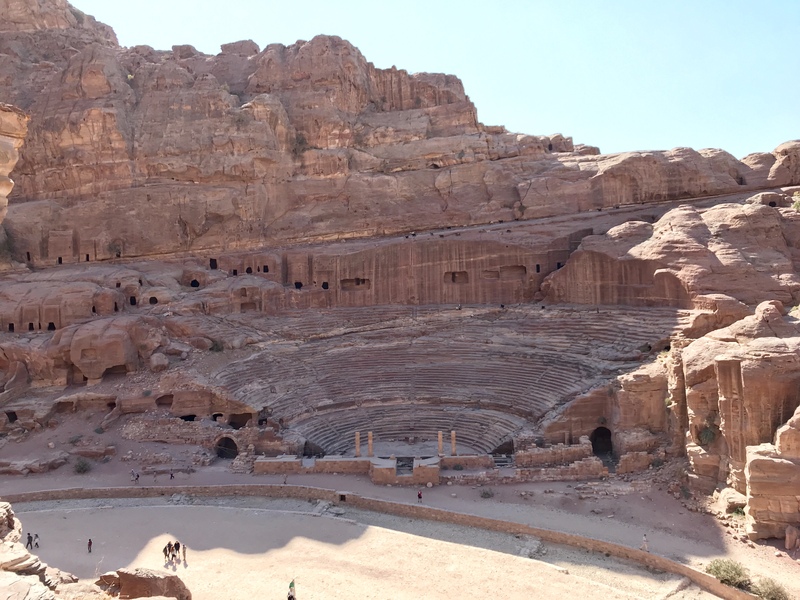 One last declaration the Nabatean are still king here. Reaching the end, I took a long loop back before I call it an early day at 3pm after five hours of walking. My stomach punishing me with pain because I forgot to bring any food. Eating last at 5am. 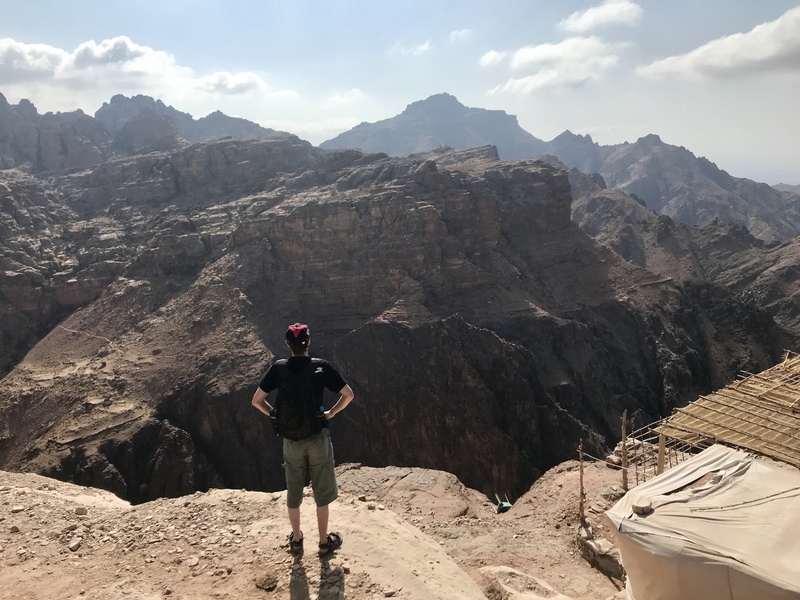 I kinda felt that I saw everything the first day, but I already planned on two days in Petra so I decided to walk two of the harder trails in the park. Both resulted in ascending a few hundred stairs. To my joy, upon arriving to Petra at 8am it lacked the mob of tourists and also showed a reduced desire for people to ask me to buy things. 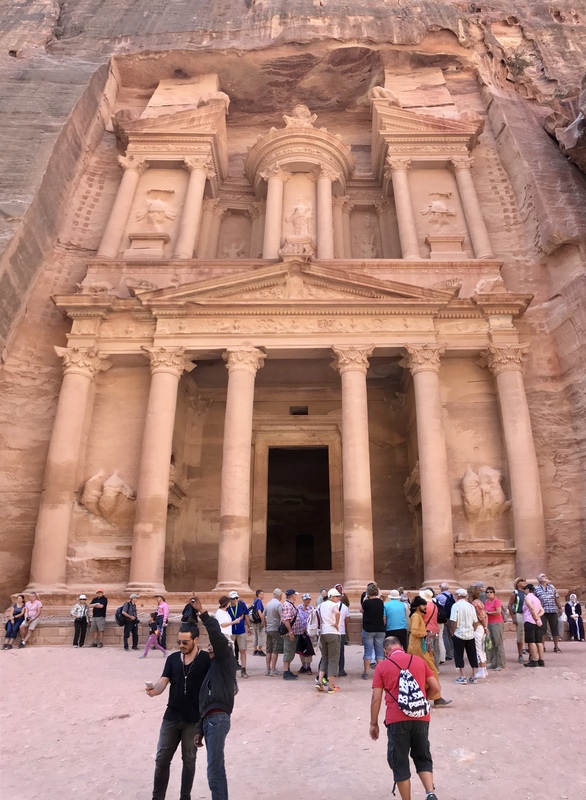 With a quieter atmosphere and one dozen people surround me instead of hundreds I felt more at peace exploring Petra as I walked past the Treasury Building. Giving it another long appreciative gaze. 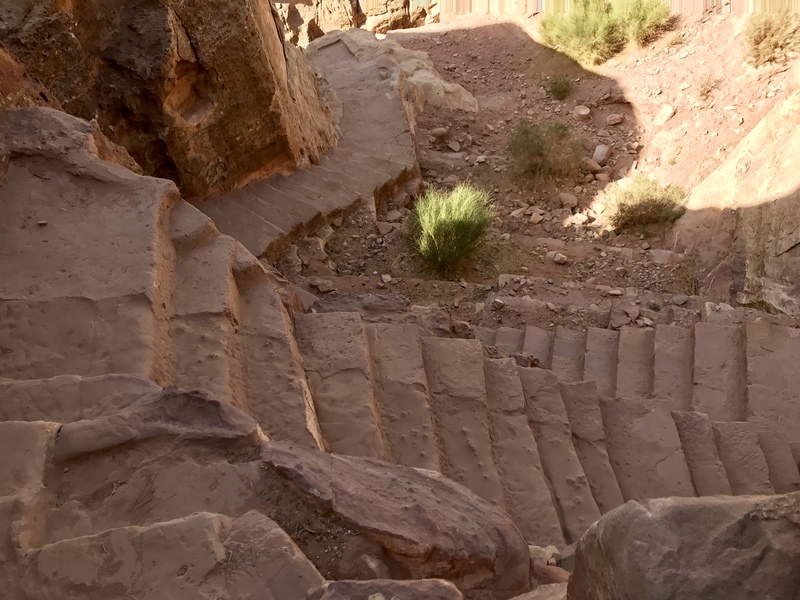 The trail up to the High Place of Sacrifice lead to a wonderful lookout over the city of Petra. The sacrificial platform wasn’t quite the reward I was looking for but on the way down the large unexpected Tomb of the Roman Soldier grabbed my attention to make the trek worthwhile. 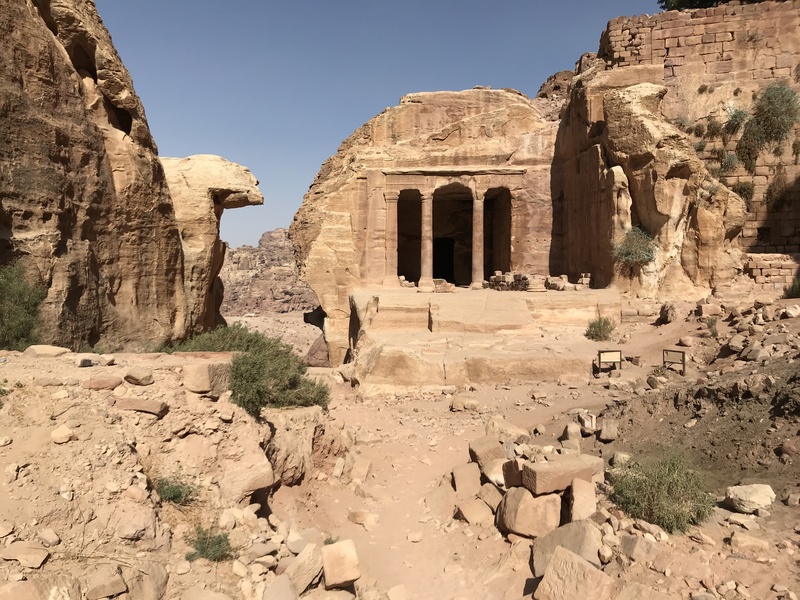 Passing through the Nabatean Museum area (the main trail terminus) to start the Monastery trail, I lunged up hundreds of steps. This time fully rewarded with a building less ornate than the Treasury but so massive (46m x 51m) I had to walk backwards to take it all in. I had no idea another building of this size existed here! After a lunch gazing into the Monastery, I trekked out to the cliff edge for an incredible view over the sandstone canyons and then their decomposition into a desert. Unfortunately, at all the best view points little shop like buildings had been constructed so I probably missed a more panoramic scene by desiring peace to take in the scenery instead of explaining how I have everything I need. Petra is amazing, well worth the experience. 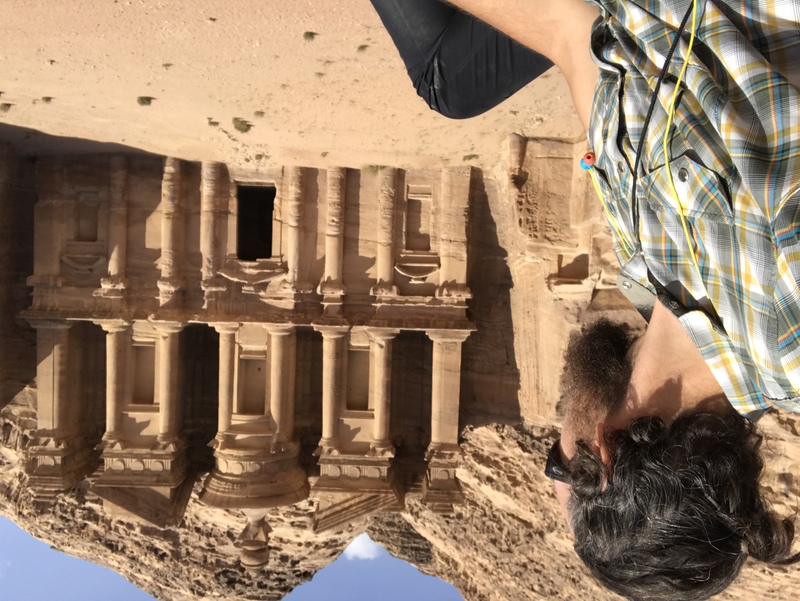 I spent two days in Petra covering a lot of ground, hiking a total of 24 miles. My recommendation would be to do a single overnight. Departing the bus, taking in what the main trail has to offer before continuing to the Monastery and then exploring off the Al Khubtha Trail with any time you have left on the way back. It’s a long day from 10am – 5pm (when you must exit the park) BUT that is the best stuff. Then have a good sleep and head onto Amman or Wadi Rum the next day. I felt like I spent two half days in Petra and Wadi Musa doesn’t have much else to offer instead of high prices. Oh, and don’t ride a donkey. I recommend you reserve a seat on the JETT bus from Amman to Petra beforehand by having your hotel staff call. You will pay the 10 JD when you arrive at the JETT bus station. A man with overflowing worries and little understanding of language barriers didn’t have a ticket but still got on the morning of by putting his passport in a standby queue. Even though the bus was full, several people still got on like this. If you don’t get a seat you will have to wait the following day or take a taxi (45 JD?). There is only one 6:30am bus a day and the JETT station starts checking people in at 6:10am. This bus will drop you off at 10am right at Petra. 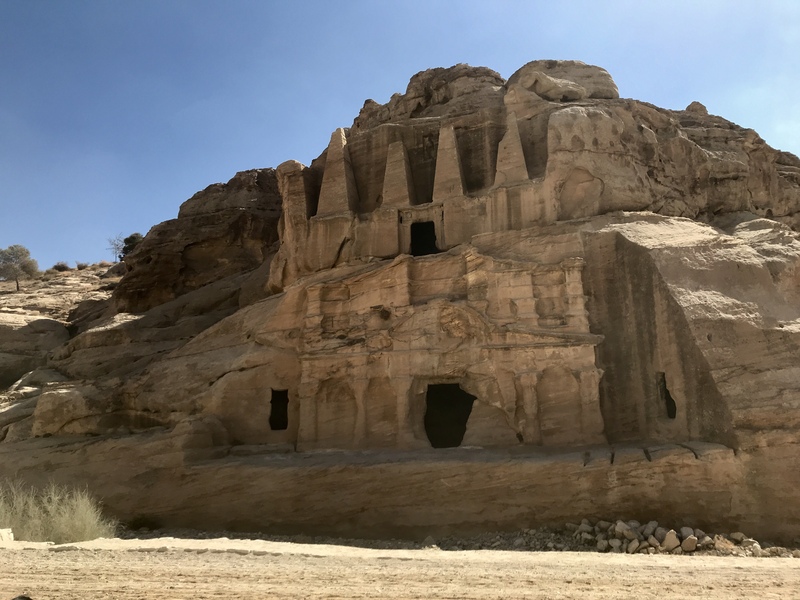 I felt like all the hospitality, cheap food and kind demeanor of Jordanians I experienced in Amman was stripped away as soon as I entered Wadi Musa (the entrance city for Petra). Amazing food could cost 1-2 JD in Amman but here costs 7-14 JD. Taxis will try to get 3-7 JD from you but will eventually accept the standard rate of 1-2 JD. Constantly (like every ten minutes) walking through Petra I was asked if I wanted a donkey ride, tea or to buy something. A common scheme is saying a donkey ride is included in the ticket just after the entrance. My worst experience was one driver who started saying it was 100 JD to go to Wadi Rum in casual conversation but eventually offered 35 JD (there is a 6 JD bus). Given all this enterprising action going on there are tourist police everywhere so any misgivings that cannot be resolved can also be brought to them.